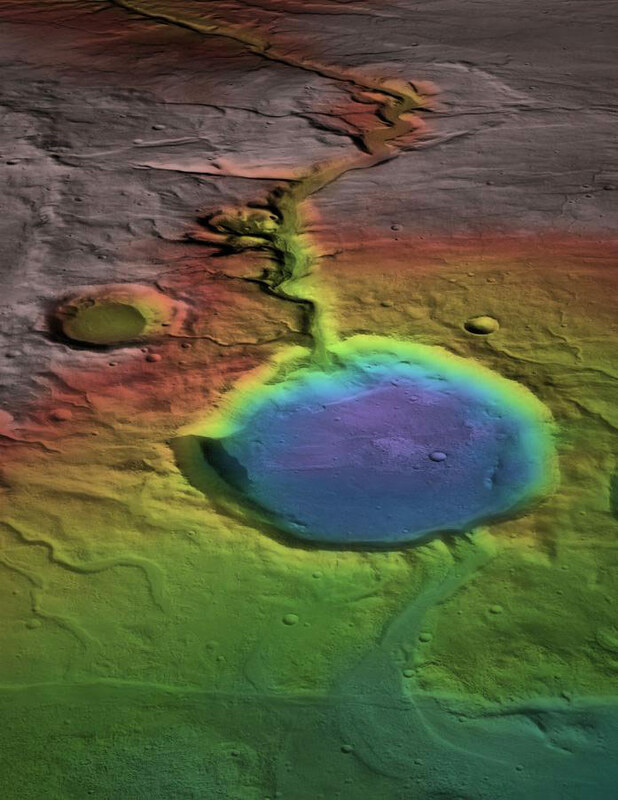 Although the surface is now cold and desiccated, in early Mars history water formed an open-basin lake, filling the crater, forming a delta, and breaching the lower rim as water flowed to lower elevations (blue). New research from Brown University and Israel’s Weizmann Institute of Science shows that warmth and water flow on ancient Mars were probably episodic, related to brief periods of volcanic activity that spewed tons of greenhouse-inducing sulfur dioxide gas into the atmosphere. Providence, Rhode Island (Brown University) — Ample evidence of ancient rivers, streams, and lakes make it clear that Mars was at some point warm enough for liquid water to flow on its surface. While that may conjure up images of a tropical Martian paradise, new research will be published in Nature Geoscience throws a bit of cold water on that notion. Be the first to comment on "Research Shows Volcanism and Greenhouse Gas Could Have Warmed Mars"